The Gibraltar sea level station is administered as part of the UK South Atlantic Network and the Global Sea Level Observing System of the Intergovernmental Oceanographic Commission (IOC). Plots of real-time data from Gibraltar can be obtained from the IOC Sea Level Monitoring Facility. Ocean currents flowing through the Strait of Gibraltar cause the level of the Mediterranean Sea to rise and fall and ultimately affect the ecosystems of the region across a wide area. These currents are both tidal and non-tidal in origin. The ocean tide is caused by the gravitational forces of the Moon and Sun, and result in larger tidal amplitudes in the Atlantic Ocean and relatively smaller tidal amplitudes in the Mediterranean Sea. If the Mediterranean were a completely enclosed sea, its tides would be very small. However, tidal flows in and out of the Strait bring with them tidal energy from the Atlantic resulting in quite measurable tides over much of the western Mediterranean Sea. Non-tidal flows through the Strait are caused by the weather (both air pressure and the action of the wind across the sea surface) and by density differences between the adjacent Atlantic and Mediterranean waters. One way to monitor all these flows is to use a network of sea level stations (tide gauges), and the station at Gibraltar provides a particularly interesting component of such a network. A number of countries are collaborating in the construction of Mediterranean monitoring systems and the Gibraltar gauge will contribute to those efforts and also to the Global Sea Level Observing System. Data from the Gibraltar tide gauge are also important for harbour operations as ships need to know how deep the water is underneath them. Data are also needed by coastal engineers in order to design structures near to the sea, and are of course required to give warning in the event of floods. Increasingly, data are also being used in a range of environmental monitoring activities. The measuring system consists of an Ott Kalesto radar gauge mounted on a quay edge stanchion. The quay edge system is powered by a 110 volt supply from a building nearby. The housing on the stanchion contains the power supply unit, a back-up battery and a radio transmitter. 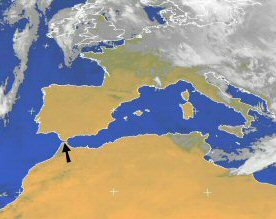 The data are retrieved by the National Oceanography Centre via the telephone and the Meteosat satellite. 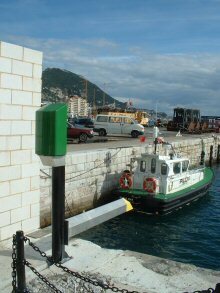 A ‘float and stilling well’ tide gauge system had been operated at Gibraltar for many years (1961–2000) by the UK Hydrographic Office together with the Queen's Harbour Master. This gauge recorded continuously the level of the sea on a paper chart. All the historical data from that tide gauge are available from the PSMSL website. However, a new tide gauge system was needed to replace the old equipment. In 2004 the Proudman Oceanographic Laboratory (POL) was commissioned by the Gibraltar Port Authority to provide a state-of-the-art radar gauge system at the North Mole. This provides continuous measurements of sea level in electronic form which are radioed to the port office and by telephone to a data centre at the National Oceanography Centre. The data are quality checked and then made available via the website.